This post is going to get updated all day, so check back here if you are interested in seeing how I fare throughout today’s Readathon. 8:00am (Hour 0) – Here we go again. I have coffee in hand and I have 20 pages to go to finish Patricia Brigg’s Wolfsbane which I started last week. I’m already procrastinating and joining in a mini-challenge for hour 1. I have a scar on my forehead from balancing on some bricks around a garden bed and falling when I was 4 years old. 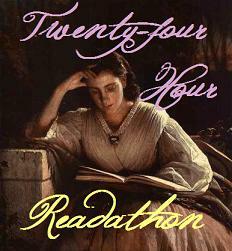 4)Do you have any goals for the read-a-thon (i.e. number of books, number of pages, number of hours, or number of comments on blogs)? Nah, I’m going to take it easy this time. 5)If you’re a veteran read-a-thoner, any advice for people doing this for the first time? Just have fun! 9:00 (Hour 1) – I’ve read 30 pages and finished Wolfsbane by Patricia Briggs. I’ve updated goodreads and paperbackswap and I’ve been playing with html so I can get a progress bar (see above). Now I have to go find my copy of The Thief so I can start that next. 10:00 (Hour 2) – Um.. I was on twitter, then replied to comments, found The Thief, but for reading – I have actually been researching something for work. 😛 I suppose rereading the same 15-20 pages in a reference book may count as reading? I’m also watching The Husband run around as he’s getting ready to drive up to Vermont for The Tour of the Battenkill and ‘helpfully’ asking if he packed this or that. 12:00 (Hour 4) – I took a break to eat something, say good-bye to The Husband, more tweeting. Read 50 pages of The Thief by Megan Whalen Turner. Liking it you guys. 2:00 (Hour 6) – Had some lunch, took a shower, had tea and biscuits, read 75 more pages of The Thief. I really am taking it easy this time. Am considering doing laundry..
3:00 (Hour 7) – Not really sure where the time goes. I only read 20 more pages. I guess I was cleaning up the apartment a little bit and checking if the laundry room is free (it’s not). 5:00 (Hour 9) – Well I’m on page 178 of The Thief, so I’ve read uh, 33 more pages in 2 hours. This is pretty bad eh. I don’t know what it is, but I’m SO ANTSY this readathon! I have done my laundry. Folded. Had dinner. Talked to the husband on the phone (he reached Vermont fine). Cleaned the bathroom some more. Feeling a bit more like I can sit and read now though. Maybe. 7:00 (Hour 11) – Is it seriously 7? Yikes. So… I vacuumed. I know, there is something wrong with me! I need to stop cleaning and read! *slaps self*. In other news, the sister called so that was a good half hour taken away from reading time. And I watched an episode of Empty Nest. Another half hour. I read 30 more pages of the book. 9:00 (Hour 13) – Just past halfway! I have finished The Thief! I guessed part of the ending but I still liked how it went. And I read the 16 pages of extras in my copy (loving the book recommendations by the author!) So now I’ve read 88 more pages, for a total of 326. Hey, getting better there. 12:00 (Hour 16) – Finished Calamity Jack, a graphic novel by Shannon & Deal Hale, illustrated by Nathan Hale. 144 pages, so still going. 1:00 (Hour 17) – I’ve been having cuddle time with the cat. He’s on top of me right now, with his face in my neck. Luckily I have a laptop and don’t need to see the keys to type. For the past hour I’ve just been surfing the net. I’m tired and I have to get up tomorrow and work. I think the idea of that has made my mind not fully engaged in the readathon this time. Oh well. I’m off to bed! This entry was posted in events and tagged 24-hour read-a-thon by janicu. Bookmark the permalink. Good luck today and hope you have lots of fun! I hope you have a wonderful time this weekend and get a lot read. Thanks! I will try, but I think this time I’m feeling lazy! I’m definitely taking it easy. Pet squirrels – well we loved them (they used to sit on our hands and eat a piece of banana for breakfast!) but they were very fragile. Most of their deaths were accidental – poisoning or getting hurt because they’d go somewhere they shouldn’t have. Basically, you had to be very careful with them. YAY, you’re liking The Thief so far! To tell you the truth, I found The Thief just okay and I fell in love with the series with Queen of Attolia. Although from my experience, The Thief got better when I reread it. Really? I like Gen’s character a lot, so that’s what is making me happy with this one. Trying to figure out the world though – they eat bread and cheese during the journey (on horses), but guns exist? Hmm. Interesting. Congrats on reading 175 pages! I love your status update bar! 🙂 Thank you. Heh, I like seeing it move, so it’s helping with motivation. I know, the day has been flying by. Looks like you’re having a good read-a-thon! Sounds like you’re having a clean-a-thon! Good luck with your reading! I AM. I need help. Sounds like you’re making great progress, but be careful about slapping yourself! When it gets late in the game, you might knock yourself out! You are doing well. Remember to rest and snack as needed. Happy reading! So glad you could join us today and hope you had fun! By what we love the most! Let’s hear it for the readers! 🙂 Thank you for the poem! Wow, you did awesome! I also saw you won a prize on the read-a-thon page, congrats!! Huh, I did? I didn’t know this. I guess I’ll go take a look.